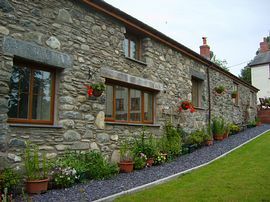 Tyddyn Isa is a delightful stone barn offering spacious self catering accommodation for up to 6 people plus cot. Located in a superb countryside setting within the Llantysilio Mountain Range, with undisturbed views of the open countryside, on the outskirts of the picturesque village of Carrog, which lies on the banks of the River Dee, near the beautiful town of Llangollen. Ideally situated for those who want to explore the North Wales Coast, the historic castles of Chirk, Conwy or Harlech, or participate in some of the many multi-activity-adventure sports held in such places as Bala, Snowdonia and Llangollen. You may just wish to take time out to chill and relax visiting the gardens of Bodnant or Erdigg or some of the many National Trust properties around. For people who love walking explore the Berwyn Mountains, the Llantysilio Range or not too far away the Offas Dyke Path. Tyddyn Isa is restored split level barn conversion with spacious lounge with vaulted ceiling and superb feature inglenook fireplace and solid fuel log burner. 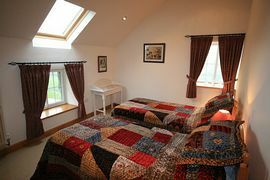 Three double bedrooms (1 downstairs), one King size bed, one double bed and one twin. A fully fitted kitchen, dining room with vaulted ceiling. An upstairs bathroom and downstairs shower room. Outside there are enclosed gardens with outstanding views, double garage fitted with kennel and dog run, barbeque area and off-road parking. There is also a boot-drying room with tumble dryer and clothes hanging facilities. 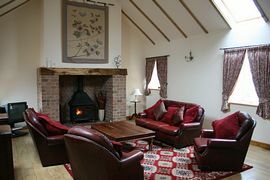 The barn is fitted with its own hot water and central heating system. 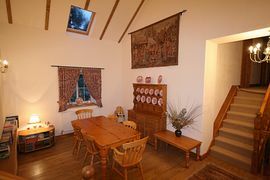 The property is fully double glazed to offer all year round availability. 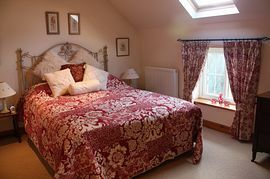 It has been decorated and furnished throughout to a high standard to provide a comfortable and relaxing environment. All bed linen and towels provided. One bath towel/hand towel per person. Large enclosed gardens with outstanding views and some wonderful walks. Double garage with enclosed dog run. Secure lock up for bicycles and outdoor equipment. Boot-drying room with tumble dryer and clothes hanging facilities. Garden furniture, barbeque etc. Local Services: Local leisure centre/swimming pool close by. Local shopping, 4 mile or 11 mile. Local pub - 1.5 mile. Leave at junction 10A on to the M54 Telford/Shrewsbury, at Junction 7 M54 becomes A5. Follow A5 towards Llangollen, continuing a further 8 miles to Llidiart y parc. Take the right hand turning by the garage towards the Station, continue over the bridge and bear left up past the Grouse Public Inn and through the village, turning right between the Village Hall and the Church. Proceed straight up the lane past the school for approximately 1.5 miles past Allt y Celyn, the property will be found on the right hand side approximately one quarter of a mile. Leave M6 at Junction 20A on to M56 signposted for Chester. Leave M56 at Junction 15, join M53, M53 becomes A55 follow as far as Junction 35, turn left towards Wrexham. Cross over two islands and at the third turn right signposted Corwen A5104. Continue to the staggered crossroads, straight across. Continue for 9 miles at the set of Traffic Lights go straight across (Crown Inn on corner). Continue on the A5104 towards Corwen. At Bryneglwys, turn left into village. Continue through village and continue for two miles and the property will be found on the left hand side. Cross Anglesey on the A55, pass over the Menai Bridge and continue down the A55 towards St Asaph. Continue on the A525 signposted Denbigh/Ruthin. At Ruthin take the A494 to Corwen, continue approximately 11 miles to the T Junction, turn right, continue for a further quarter of a mile to a set of traffic lights, turn left for Corwen. Continue through Corwen along A5 towards Llangollen, turning left at Llidiart y Parc, (by garage) signposted Carrog. Continue over the bridge and bear left up past the Grouse Public Inn and through the village, turning right between the Village Hall and the Church. Proceed straight up the lane past the school for approximately 1.5 miles past Allt y Celyn, the property will be found on the right hand side approximately one quarter of a mile. Prices range from £395.00 off peak to £650.00 peak periods. (Off peak period is from 1st October to 30th April, excluding Christmas;New Year and School holidays). Please Email or Telephone us for full information. Usual change over day is Saturday.